I was looking forward to the day like a child anticipating a special gift. The day was going to be packed, that much I knew! The afternoon to 8pm was spent cheering CSK on at the Chepauk stadium as they beat KKR in the IPL 6 tournament and then came the special event of the day. I was heading over to friend’s house, to shower change and head off to ITC Grand Chola for a dinner at Pan Asian. It was courtesy a twitter contest I had won earlier the week. And since I was told I could bring a friend along, i chose A. She was ready by the time I made it to her apartment, and it was nearly 8.30pm. A quick shower and I was ready. We reached ITC Grand Chola close to 9.15 and we were welcomed by their Marketing Manager. The last time I was here was in Dec when I had enjoyed a one night two day stay and a relaxed lunch with another friend of mine. This time I was indulging in a new restaurant that had just opened up- The Pan Asian. But before we were taken there, we were given a tour of the place, including the recently launched Royal Vega, the pure vegetarian restaurant on the 1stfloor. The restaurant is ROYAL, true to its name. 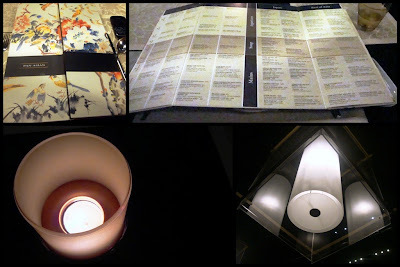 There are tables set up according to themes and one of them had plates with covers that were heavy, and I mean heavy. They were embellished with stones and what not. There was a secluded room that was ideal for a small family gathering, and it was beautiful. There was a mannequin decked up in traditional attire. The beauty was that the room could be split into two, to host two small groups. Anyways, before I wander off all over the place, we made our way towards Pan Asian. The restaurant sports a narrow passage way entry and you go around the bend to see the entire space. It was huge, not a huge square but a long space. We were seated in one end of the room, near the bar and the sushi counter. I wandered over to see the display which showcased different kinds of mushrooms, cucumbers, and other meat that were used to make sushi. We were seated, and the Chef came over to introduce himself and gave a sneak peek into the menu at Pan Asian. The entire menu card could take days to read and decipher, but what I liked about it were the birds that adorned the pages, all of which were from the Oriental region of the world. 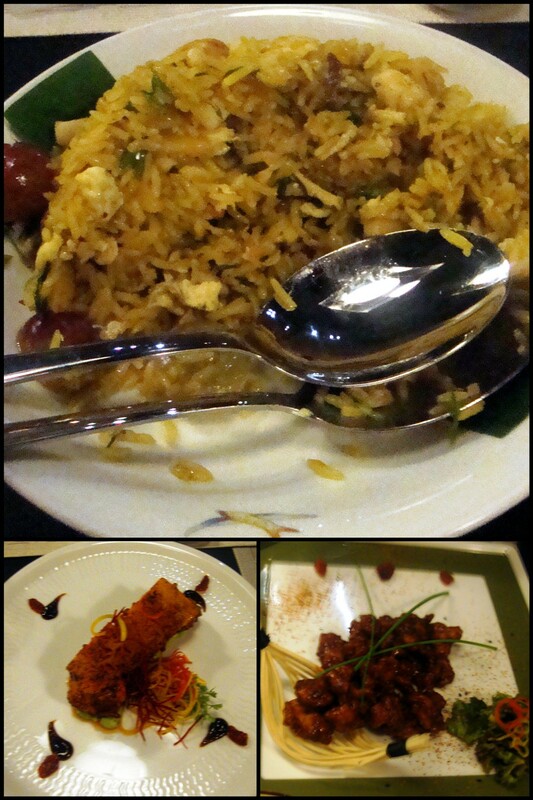 The restaurant sported dishes from these regions as well- Thai, Japanese, Korean, Chinese and so on. Most of the dishes names seemed Chinese and Japanese to us, and so we requested the staff who was serving us to help us decide. First up was the amuse-bouche - a sampler of sorts. It was a longish plate with 3 distinct items in it a small piece of tofu with a pickled carrot slice, a pickled slice of radish and a slice of white radish with a dollop of avocado cream on top. While we took in the surroundings, the music and the décor, our soups and starters arrived. I had chosen to try the familiar Tom Yum Soup, but this was nothing like what I’d had earlier. A deep bowl with the vegetables arrived, and then a tea pot of sorts was brought forward from which the broth was poured from. The soup was delicious, subtle and flavourful. Then came our starters. My friend had ordered for sushi while I wanted to try a dim sum. A cane steamer arrived on the table and within it sat cute looking pumpkin like dimsums. Even though these turned out to be pumpkin dimsums with custard filling [almost a dessert] I loved them. Only thing that had me puzzled was the texture, it was quite sticky. Between courses there was a bit of a breather, allowing us to enjoy the surroundings and the ambiance. The décor is very retro, with concrete brick walls, and simple light fixtures. For the main course we were recommended the fried noodle basket with a Chinese stir fried vegetables and a pineapple spicy thai rice to go with it. Yes, I know, I have forgotten the names of the dishes. We polished them off with delight. And we pretty soon eager to see what was in store for dessert. I chose the Green tea cheese cake while my friend chose a chocolate dessert. Both of these arrived in style, the plating was beautiful. we dint have the heart to cut into our dessert and spoil the whole plating. 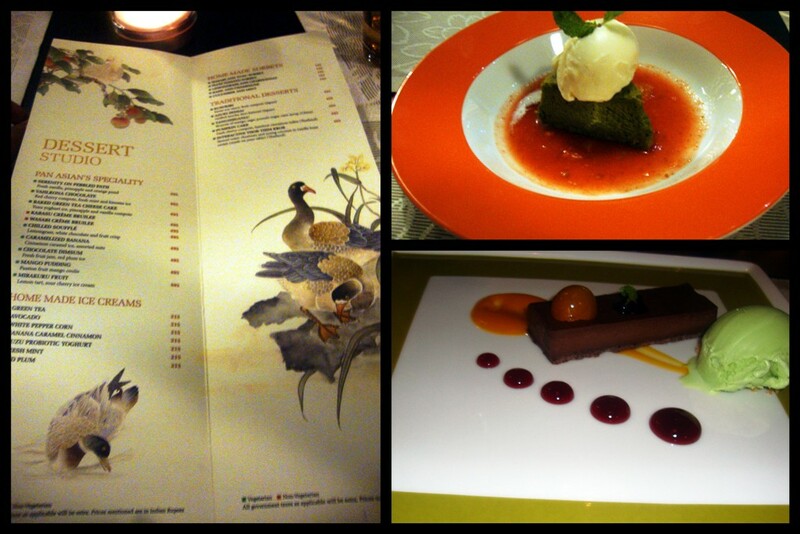 It was colourful, and the desserts were quite large in portion size. We chit chatted a bit longer with the staff before bidding adieu. We were happy, content. 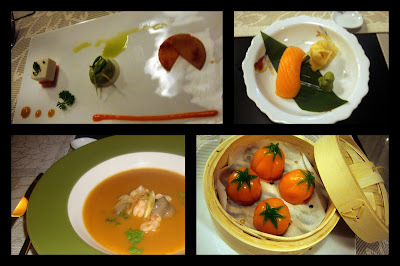 Not only did we get to enjoy some amazing dishes, but it was an evening worth remembering. More so since my friend was soon moving away, out of the city. 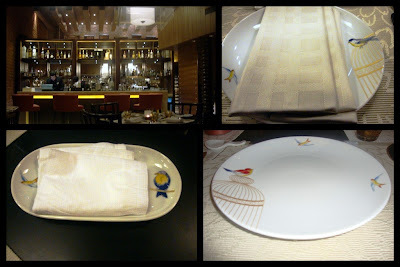 ITC Grand Chola is more than just rooms and food, it is an experience! I have been back here multiple times, with friends and for events, and every time has been a memorable one!